It is usually not complimentary to use the names of animals when calling another person. When you say, “You’re an ox,” you are implying that the person is dumb or clumsy. With the use of the name fox, you are inferring that the person is sly. If you call someone a pig, you are suggesting that he is either dirty or eats a lot. A snake would mean that that person is cunning or poisonous. However, there are some animal names which are complimentary, especially when these names are accorded to the Lord. We can immediately grasp the attributes of nobility and strength when referring to the eagle and the lion. But today, Jesus is accorded a title like no other. Thirty times in the New Testament and twice in today’s gospel; “Behold the Lamb of God who takes away the sins of the world!” The words of St John the Baptist is immortalised and heard in our liturgy. That formula lies at the centre of what we believe about Jesus. What does it mean? How does His sacrificial giving of Himself take away our sins? How can one person take sin out of the world? There is a rich background to this concept. The people to whom the Baptist was speaking knew exactly what was meant when John called Jesus the Lamb. This idea of the Lamb of God is a strand that runs throughout the history of redemption. It can be traced all the way back to Genesis, when God called Abraham to go to Mount Moriah and offer his son Isaac as a sacrifice. But at the last possible moment, after Abraham had tied Isaac to the altar and was preparing to plunge the knife into his heart, God stopped him. Just behind Abraham, was a ram that was caught in the thicket by its horns. God provided a lamb as a sacrificial substitute for Abraham’s son. This animal would prove to be a substitutionary sacrifice, and that is the idea that underlies the atonement of Christ. Likewise, the Lamb of God is certainly prefigured in the Passover. When God prepared to bring His final plague on the Egyptians, the death of every firstborn male of the Egyptians, including the crown prince of the Pharaoh, He instructed His people Israel to slay lambs without blemish and to spread the blood on their doorposts. God promised to pass over all the houses where He saw the blood of the lambs on the doorposts. Just as the blood of those lambs caused the people of Israel to be spared from God’s wrath, the Lamb of God redeemed His people from the penalty that was due for their sin. It was during the time of the Exodus that God gave some very specific instructions to Moses concerning the sacrificing of animals to Him. These sacrifices, made throughout the year, really culminated in an annual sacrifice known as The Day of Atonement. In Chapter 16 of the Book of Leviticus, the high priest Aaron, in this first instance, was to bring before God two goats over whom he would cast lots to determine which goat was sacrificed and which goat was set free into the wilderness, i.e. the scapegoat. The idea was that the goat was taking the sin of the community away with it. The two animals reflected the dual nature of atonement that was typified in the Old Testament sacrifice, namely one of expiation, the removal of sin and guilt (this was the scapegoat) and propitiation, the satisfaction of God’s wrath through the sacrifice of atonement (the slaughtered lamb). 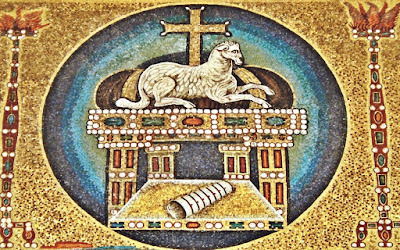 The lamb that was to be sacrificed was to be without defect and blemish, and only the best of the flock was worthy to be sacrificed to the Lord. Ponder the depth of what is happening in the story of Christ’s passion. Here is the Lamb of God who takes away the sin of the world! 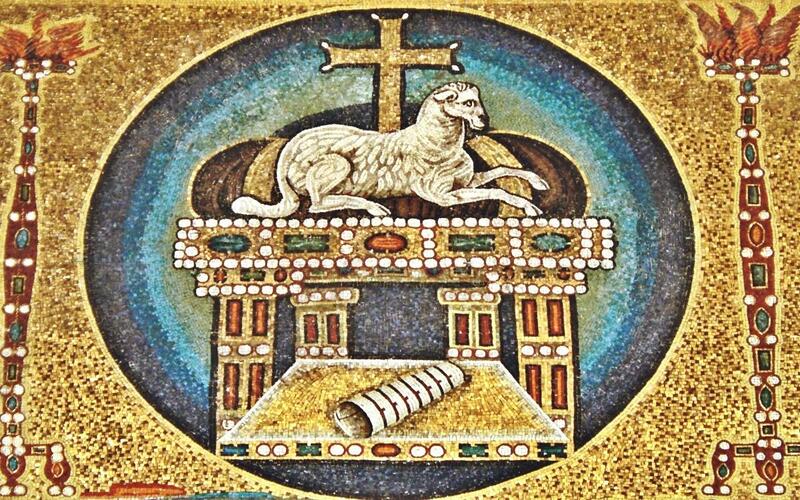 This is not simply a lamb of God but ‘the’ Lamb of God. You cannot get more obvious! Unlike the sacrificial lambs of old, the people did not choose Him but He came of His own will, fulfilling His Father’s will, to suffer for our sins and die there on our behalf. At the crucifixion, Jesus, the innocent and sinless victim, takes all of our sins unto Himself. He does not just bear our sins and suffer the due punishment for us; no, Jesus Himself expiates the sins. He as Priest offers Himself on the altar of the cross. Through His blood He washes away sin. However, unlike the Passover lamb that was slaughtered, roasted and eaten, our Lord rose from the dead, conquering both sin and death. He has truly delivered us from the slavery of sin, shown us the path of salvation, and given us the promise of everlasting life. He has made a new, perfect and everlasting covenant with His own blood. For this reason, Christianity, among all the religions and philosophies of the world, is the only one that worships the scapegoat. Despite how modern people would constantly spin the Christian story, Jesus' is no mere inspirational story designed to draw out the good in us and lead us to emulate Him. Jesus is not some prototype of what we can be if only we tried harder. He is not some motivational coach to help us discern the wise path to success. No, Jesus did not merely come to shine the light on goodness but to expose sin to His Light, to suffer for sin, to die its death for us, and to be raised to draw us unto Himself. Jesus came for sin, to wear it for us and bear it for us, that we might wear His righteousness and bear the baptismal mark of the people of God. He came to do what only He can do and we can never possibly accomplish on our own. Everyone in this Church deserves just punishment for our sins and today we are reminded once again that there is only one that can lift that sentence – He is Jesus, the Lamb of God who takes away the sins of the world. The question facing us is simple – where do you find this Lamb of God who takes away the sin of the world? Is He a creation of your own imagination? No, I will tell you where the Lamb of God who takes away the sin of the world really is. He is here in this mass. St. John Chrysostom (d. 407) preached of how the mass symbolised the Passion of Christ: “What Christ did not suffer on the Cross, He suffers in the sacrifice for thee.” He is here hidden in the bread and wine that ceases to be bread and wine at the consecration. He is here, in the flesh, in the Body made substantial and tangible and real, held up by the priest at the moment before we are invited for communion. He is here, as the priest boldly repeats those ancient words that first appeared on the lips of the Baptist, “Behold the Lamb of God that takes away the sins of the world,” and then adds, “blessed are those who are called to the supper of the Lamb”; to which we reply, “Lord, I am not worthy that you should enter under my roof, but only say the word and I shall be healed.” Words suggesting much humility and modesty, and yet hopefully spoken with the same excitement of the Baptist who uttered it for the first time on the banks of the River Jordan. Just like him, we get to behold more than just what meets the eye. With eyes of faith and wonder, we behold our salvation and our redemption.